The article which follows is the editorial to Revolutionary Perspectives 06 which all subscribers should now have received. Besides a brief comment on the topical issue of Greece it also introduces the other themes of the journal. We will be publishing these over the next few weeks but if anyone cannot wait or would prefer a proper printed copy they can email the contact address uk@leftcom.org for a copy (£5 including postage). As the first majority Conservative Government (elected by 24% of the voters) in 20 years wastes no time in attacking low waged “working families” in the UK (see article on the Summer Budget) the agony of the Greek working class goes on. The referendum was, as we predicted in the positional document of the Internationalist Communist Tendency, a cruel trick. The Greek working class were told that to vote for the “Yes” option was to accept certain austerity and penury. True. But as we said at the time voting NO actually either meant “Yes” or it meant Grexit from the Eurozone. The choice was a false one. The outcome would be the same whatever the vote. Syriza’s purpose in calling the vote was to a) to keep their own shaky party together in face of the fact that their policy of trying to use debtor blackmail to browbeat its creditors into accepting debt relief had failed and b) involve the working class in its final decision. The campaign was unashamedly nationalistic and amidst much flag-waving in alliance with the nationalist ANEL party and the fascists of Golden Dawn Syriza told the voters that it was about avoiding “national humiliation” in the face of intransigent international creditors. The final Syriza argument was that it was a vote of “democracy against austerity” so that a NO vote would give Tsipras a stronger hand to get a better deal with the Troika of major creditors. We now know that even this turned out to be a fantasy and that Syriza have been forced to accept even more draconian terms than was on offer before the referendum. There is no doubt that some of this is political. This is particularly the case in Germany where a vicious, almost racist, nationalist campaign has been conducted against the “lazy Greeks”. German workers were suffering from cuts (under the SPD’s Schröder) long before the speculative bubble burst as the German ruling class restructured the labour force to maintain its manufacturing competitive edge. Now the German capitalists are turning to the German workers saying you made sacrifices for the national economy so the Greeks must now do the same. It is a sorry situation which our internationalist comrades in Greece and Germany have been trying to fight in the last few years. However the current situation in Greece also tells us a lot about the capitalist crisis. If the world economy had been recovering there would have been greater room for manoeuvre for the big financial institutions to ease the squeeze on Greece. 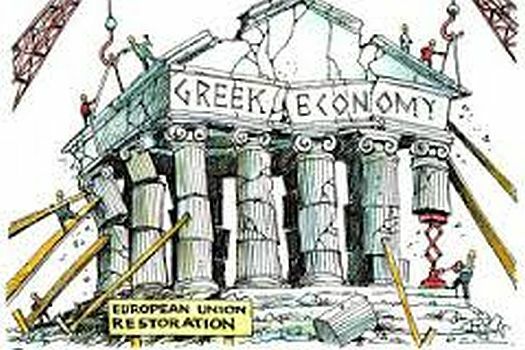 As we show in our articles in this issue on the “supposed international economic revival” and on “Piketty’s Capital in the Twenty First Century” any recovery is restricted and indeed all the policies they have adopted have failed to stimulate recovery at all. The only agreement amongst our ruling capitalists is that they have to devalue the cost of labour power in order to make more profit to pay back what they know is an unpayable debt. That means more austerity, more attacks on workers everywhere. Against this the Left wing of capitalism have no credible alternative. They too only talk of the symptoms of the problem. They propose an end to austerity which would only raise indebtedness to levels greater than it is at present. As long as we have a capitalist system based on money and finance their proposals are utopian. The fact of the matter is that real cause of all our woes is the system of exploitation that is capitalism. This is at variance with the needs of humanity. When the sub-prime mortgages crisis first burst out in 2007-8 millions unable to pay their mortgages were evicted and re-possessed. Nobody tried to save them. Yet when the crisis expanded to hit the dodgy dealings of the most powerful financial institutions in the world every leading capitalist state moved mountains of money to bail them out. The property values of the poor could go hang but the property values (even of fictitious capital) of the financiers had to be saved in order to save the system itself. It is capitalism as a whole rather than just Greece that is bankrupt but so too is any reformist notion that capitalism can be made to work for us. Syriza never grasped this. They did not see that calling for debt forgiveness would be to call the bluff of the whole system, and Greece’s big international creditors were extremely determined to avoid this. Syriza thus led the Greek working class down the garden path. Not only did their policy fail but in the 5 months since they were elected the Greek bourgeoisie “patriotically” removed €30 billions from Greek banks making life more miserable for everyone else. The truth is that there is no capitalist solution here. The EU, the IMF and the ECB.